The success of the Jungmann led Bucker to open a second factory where a single-seat derivative could be produced in parallel with the original two-seater. The single-seater was the Jungmeister (young champion) advanced trainer, essentially a scaled-down Jungmann. First introduced in 1935, quickly developed an international reputation for its outstanding aerobatic capabilities. The initial Bu 133A had the 101-kW (135-hp) Hirth HM 6 inline but better performance than the higher-powered Bu 131. Quantity production was undertaken for the Luftwaffe, though precise details are lacking. The Bu 133B export version was produced to the extent of some 100 aircraft by Dornier in Switzerland and CASA in Spain with the 119-kW (160-hp) Hirth HM 506 inline. The definitive version, however, was the Bu 133C with a radial engine: this had excellent agility and performance, and was used as a fighter lead-in trainer as well as for advanced flying training. This model too was built in Switzerland and Spain. In 1968, the Aero Technik Canary in Munich, Germany, began production of the BU-133 D-1, also called the Jungmeister. Its engine is a remanufactured Siemens-Halske Sh-14A4; however, due to this engine’s limited availability and demand for more power, a new version, the BU-133F, was built by Wolf Hirth GmbH with a 220 hp Franklin engine. 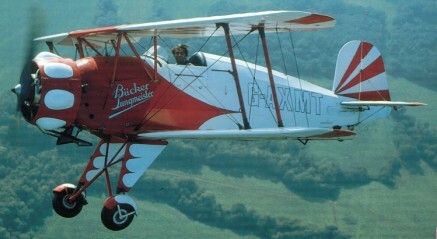 Bucker Prado Sl offered kits to build the former German Jungmann two-seat aerobatic biplane using original Bucker/CASA Bu 131 jigs, plus Jungmeister single-seat aerobatic biplane.